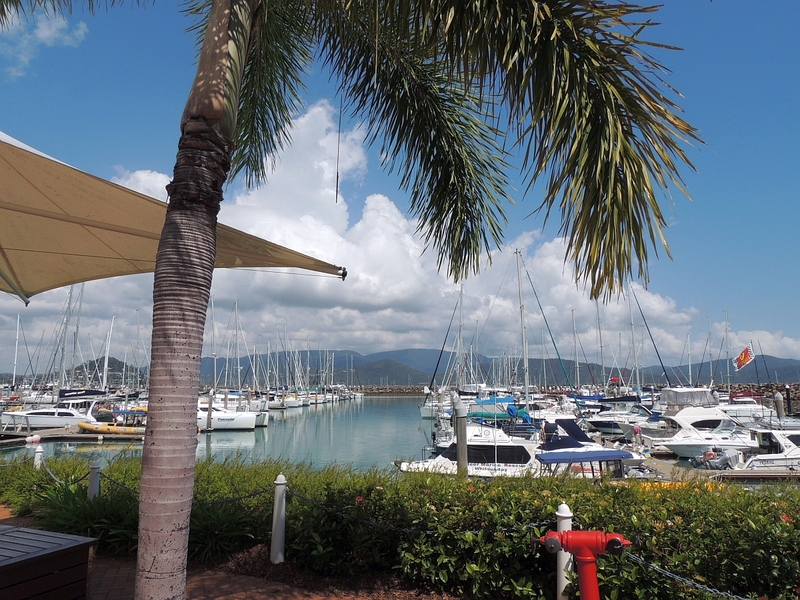 Today we are stopping at Airlie Beach. 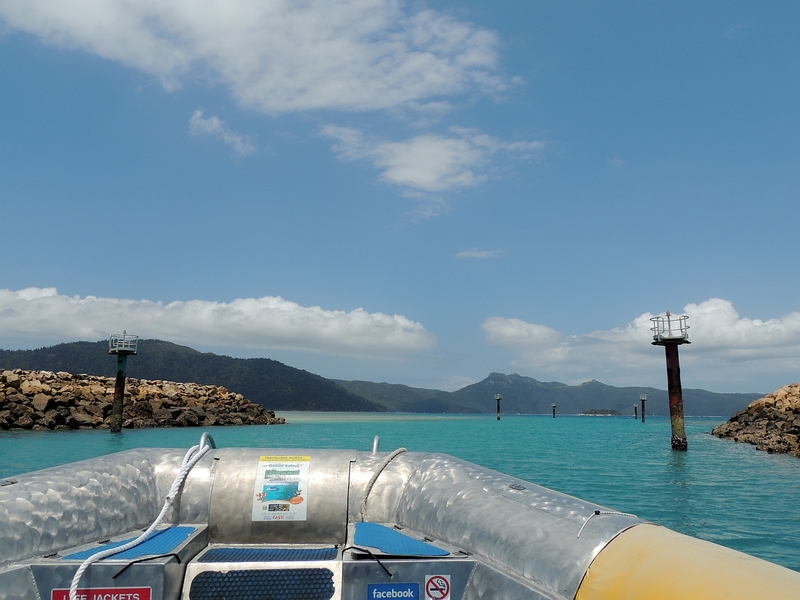 This is one of the two consecutive ports that give access to the Great Barrier Reef. Unfortunately we cannot get off the ship until 9.00am and must be back on board by 4.30pm. This doesnt leave much time as it takes a while to get out to the reef. We looked at the ship tours, but they are very expensive and the only snorkelling trip is on a catamaran with 200 other people. This didnt appeal at all, so we began to look for alternatives. 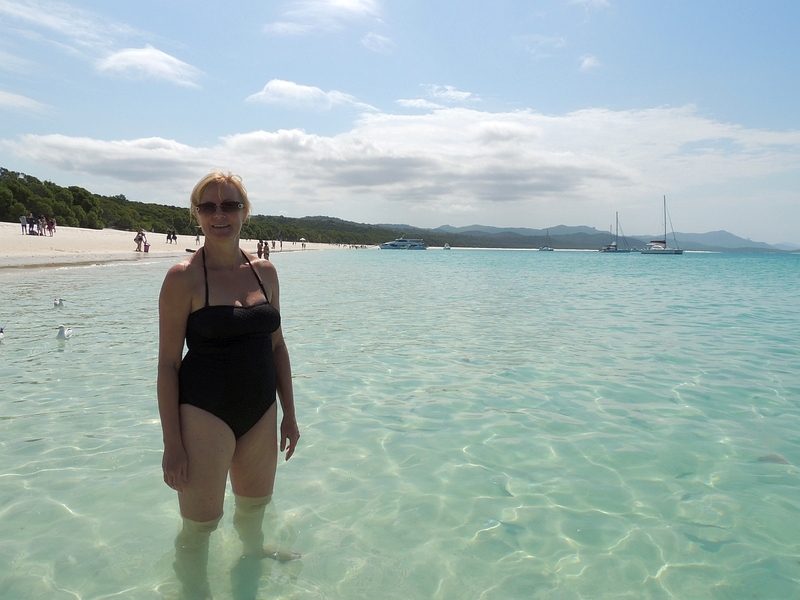 Tam found a lady named Alice on the Cruise Critic forum who was organising an excursion to the Whitsunday Islands on a fast boat for 24 people to go snorkelling and spend some time on Whitehaven Beach. This was just about perfect, so we signed up and Alice did a wonderful job of organising everything, including sorting out payment, keeping us all informed and arranging to meet up for the tender ashore. The only concern with a private tour is that they do not hold the ship if you are late back. Still, at least there would be 24 of us in the same boat (ho,ho). 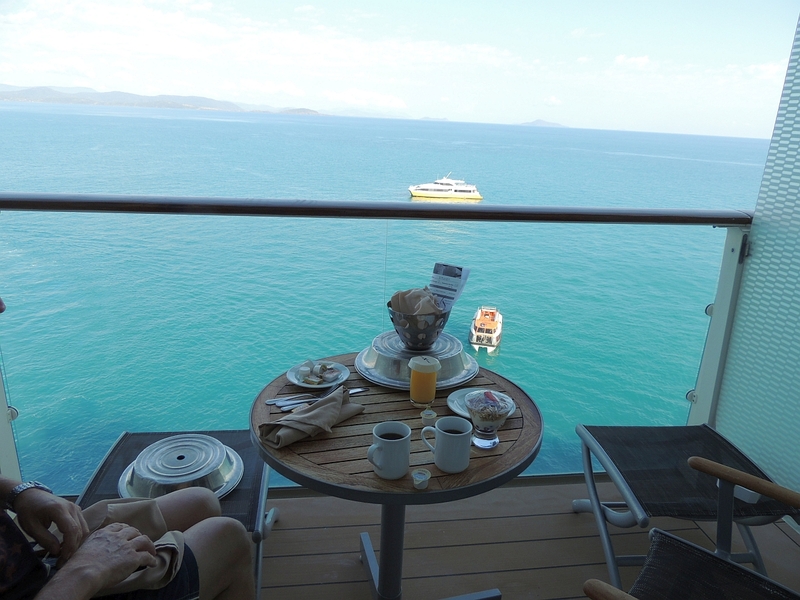 We get up just after 7.00am and the ships already anchored off Airlie Beach. We have breakfast in the stateroom, which is not all that good. Not surprising I guess, it must be near impossible to keep everything warm. Mine consists of dried scrambled egg, a nasty sausage (lets face it, nobody likes a nasty sausage) and some strange Canadian bacon. Tams granola parfait and banana pancakes are better. We meet Alice and the rest of the group by the Martini Bar and we go to our tender at 9.00am. Its quite a long tender distance at Airlie Beach and it takes around 20 minutes. Alice and Dave (Alices huband) reconvene the group when we reach dry land, but there are 4 people missing. We have to wait for the next tender for them to arrive and we all get into a bus for the short drive to the Ocean Rafting office where we are fitted out with our stinger suits. These are wet suits that protect against both cold and little jellyfish called stingers, although we never see any. Off to the boat and as we leave the harbour we see a sea turtle slowly swimming by. We are soon in open water and its great fun as we zip along for 45 minutes to our first snorkel site. 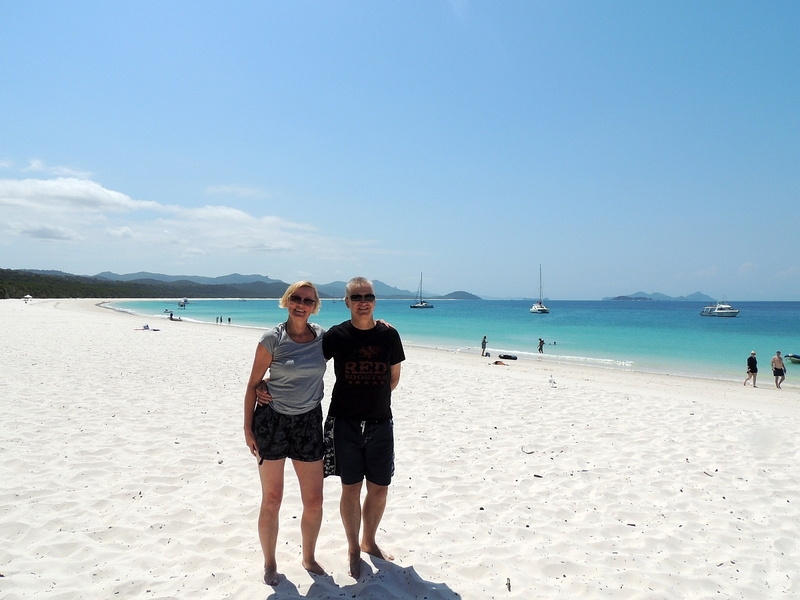 The plan is to visit two different snorkel sites and then go to Whitehaven Beach for lunch. Our crew are Sam (a lady Sam) and Matt. They give us a few snorkelling instructions and then go through some safety information. Now, I dont know about you, but Ive sat through many different sorts of safety briefings in my time and paid lip service to them at best. Well, today made me much more appreciative of why they are held and why you should pay attention to them. More on that later. We slither into our stinger suits. Those who look good in them look like surfer dudes ready for some wave action. Those who look bad look like an overstuffed black sausage. Ill leave you to make up your own mind as to which category Tam and I find ourselves. 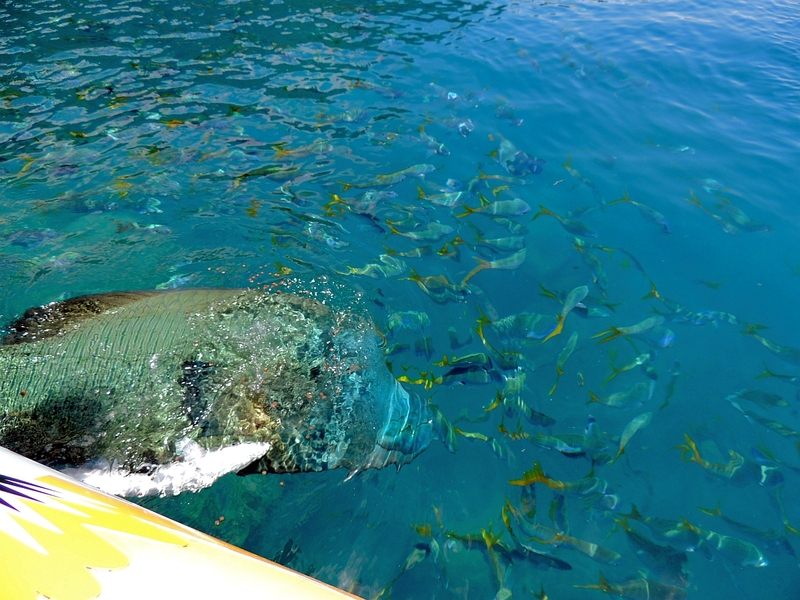 We get into the water and snorkel slowly towards the small reef. We bought a small video camera that mounts inside a waterproof case before we left, so we are keen to try it out. Tam, being the technically proficient person she is, cannot get it to work, so she gives it to me. 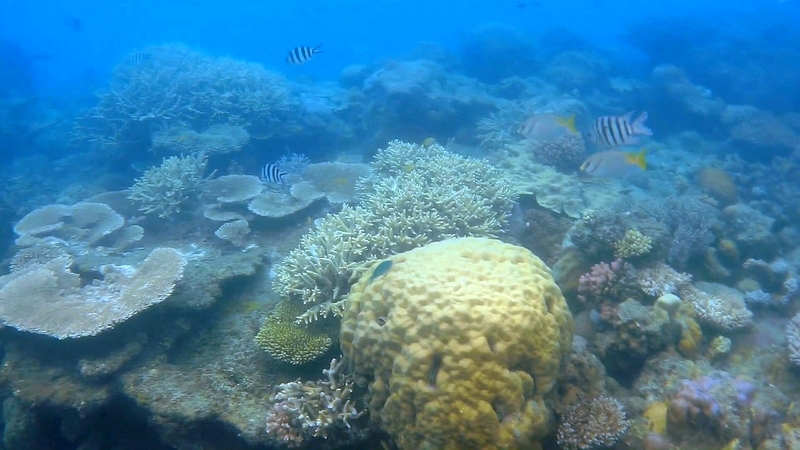 Im actually doing really well with the old snorkelling as I usually flounder around gulping down salt water, but all seems ok as I approach the edge of the reef. Its everything I hoped it would be. Colourful coral and loads of bright vibrant fish, some small, some big. Weve been in the water for less than 10 minutes when I hear a commotion and cries for help. I look up to see an unconscious man being dragged back onto the boat. Sam and Matt shout at everyone to get back on board as fast as possible. It turns out that Matt was keeping an eye on everyone and saw this guy floating motionless face down. As we climb back on board, the man is being given oxygen and is put into the recovery position. Luckily, two young girls on the tour are nurses and between them and the crew they make the guy as comfortable as possible as we head for Hayden Island. Matt has radioed ahead and a medic has been summoned. By the time we arrive the unfortunate gentleman is at least conscious and looking a little better. The medic and a stretcher turn up and the man and his wife go ashore. They are going to monitor his condition and if he is well enough they will transport him back to Airlie Beach. I dont know what caused him to blackout, but I do know that if the crew from Ocean Rafting hadnt been as vigilant, he could well have drowned. Matt advises that we wont have time to do the second snorkelling trip now and that we are going to stop in a small bay to see some fish before heading to Whitehaven Beach, where we will have lunch and time for a swim. Another 45 minute fast ride past some beautiful islands and we stop at a small inlet where Sam feeds some fish from the side of the boat. 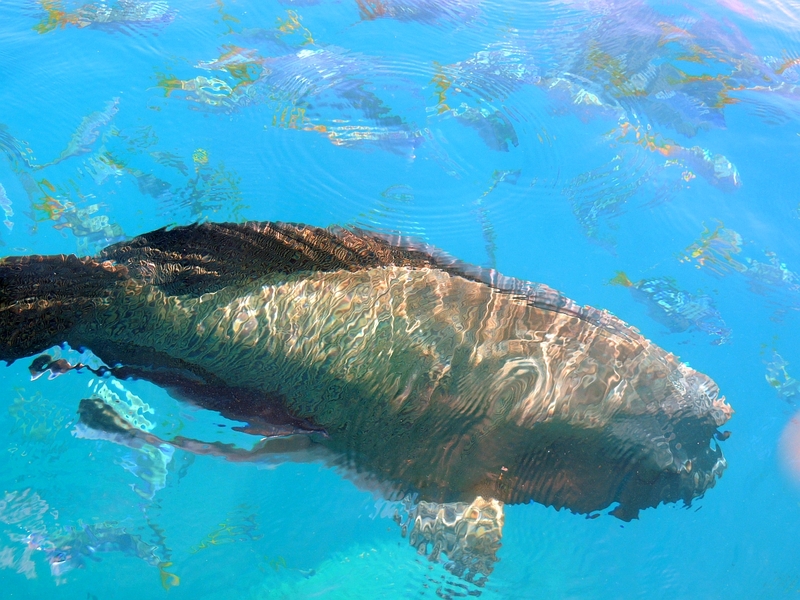 There are hundreds of small fish and then the big daddy comes along. I have no idea what species it is, but its probably the size of a childs bicycle. 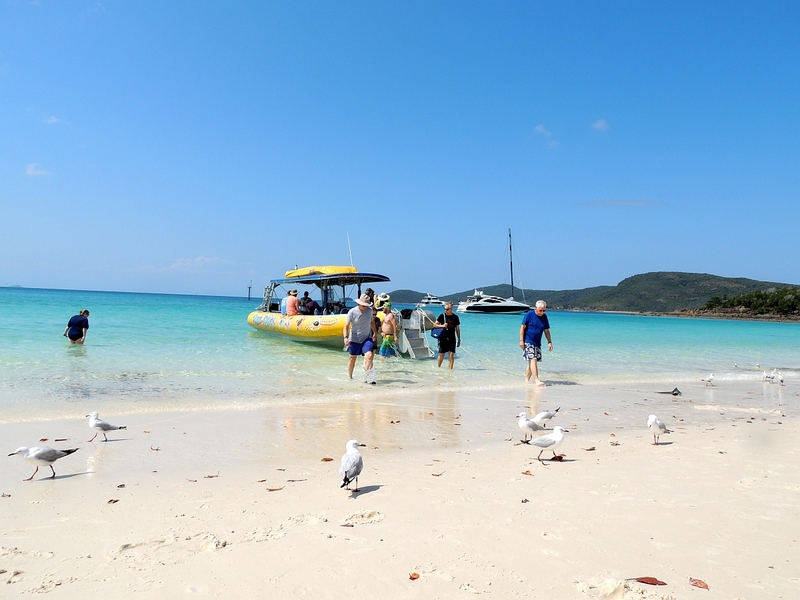 Onward to Whitehaven Beach, a one-mile stretch of bright white sands gently lapped by an azure sea. Absolutely lovely. We get off the boat while Sam and Matt prepare lunch. 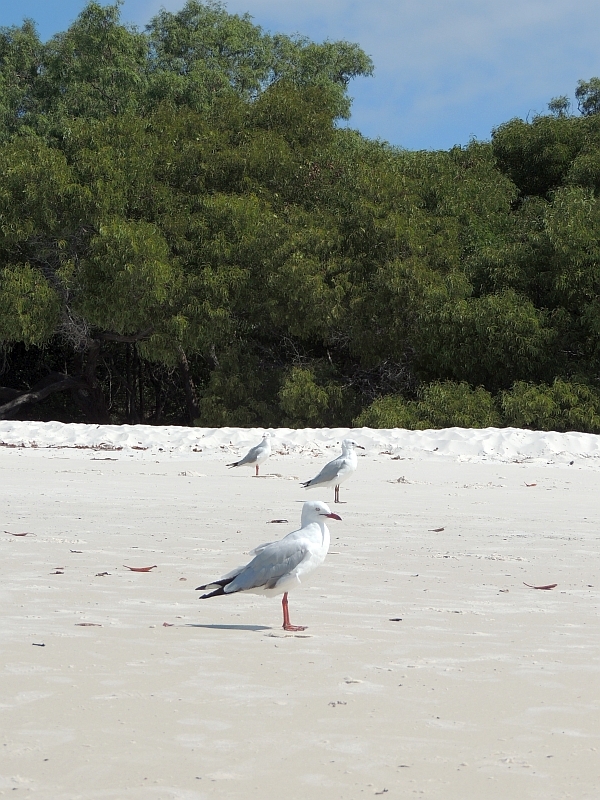 The sand is fine, white powder and squeaks when you walk on it. 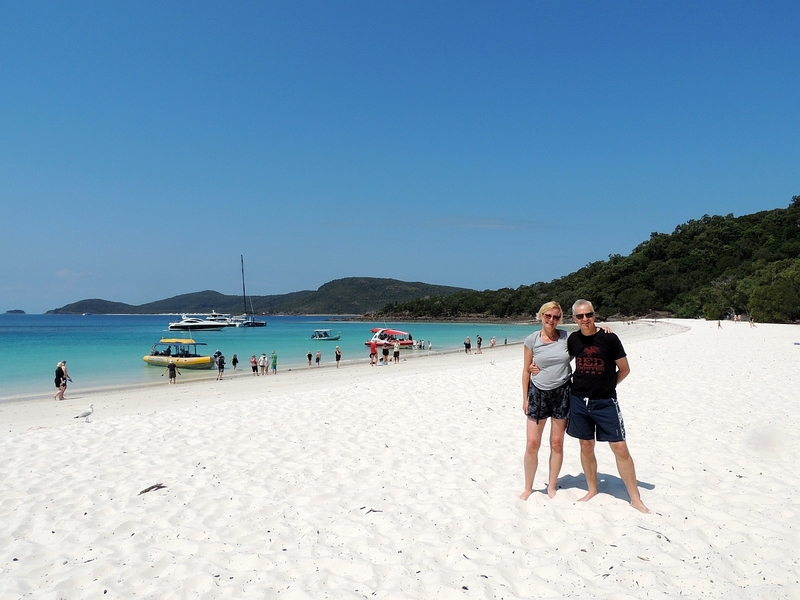 Ive never been on a squeaky beach before. 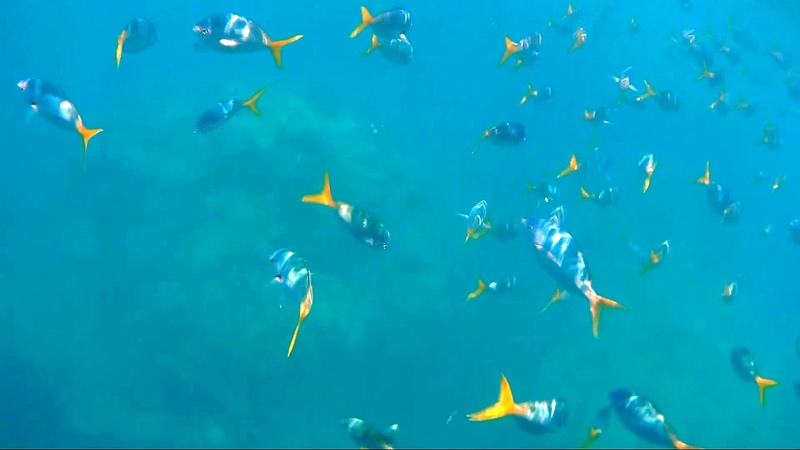 We have lunch, which is very nice, and Tam and I have a brief swim in the warm, crystal clear sea where we are surrounded by small fish curious to see what these strange land creatures are doing in their domain. It would have been nice to have had more time here, but circumstances have worked against us. It takes another hour to get back to Airlie Beach and Sam tells us that we have covered 110 kilometres in the brief time we have been out. That tells you how fast the boat travels. Matt thanks us for coming on the tour and repeatedly apologises for the curtailed itinerary. I should bloody well think so too. Youve given us a great day out and probably saved a mans life. You should be ashamed of yourself, Sir! 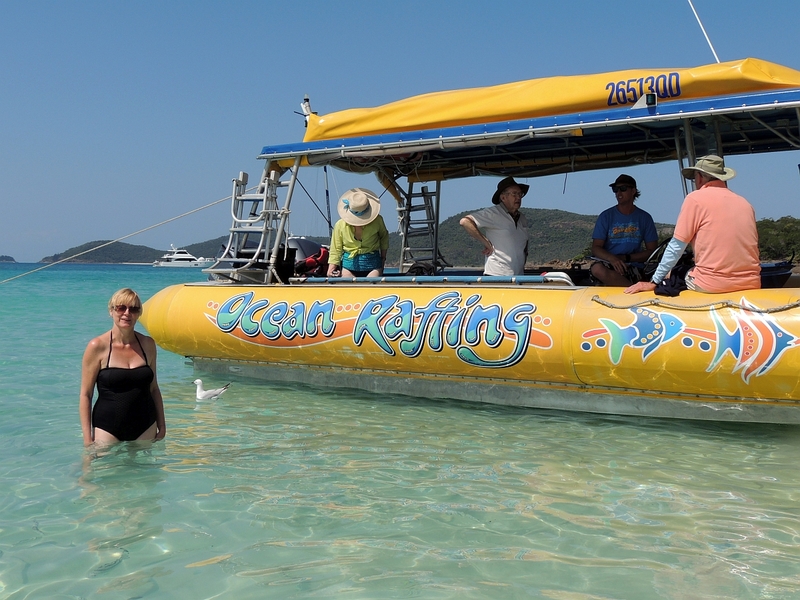 If you ever need a boat trip to snorkel the Great Barrier Reef I would highly recommend Ocean Rafting. They were friendly, fun and clearly have the safety of their customers in mind. Thanks as well to Alice for organising our trip. Our tender back to the ship doesnt take too long and we grab a Singapore Sling from the Passport Bar to take back to our stateroom. For just about the first time on this cruise we have the afternoon sun on our balcony, so were determined to make the most of it and watch the sailaway from there. The Singapore Sling doesnt last very long and Tam nips up to the Pool Bar to get us a couple of beers while I write up the trip report. 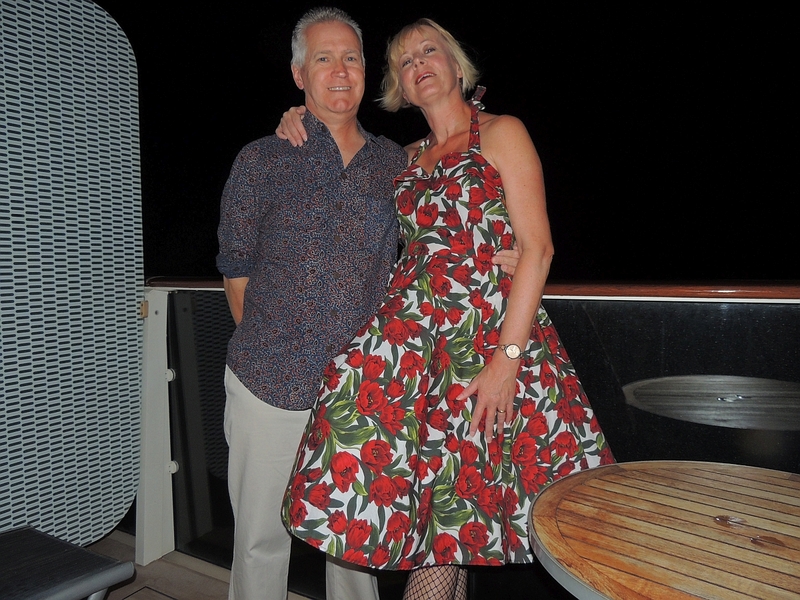 We sail away at 5.00pm, then Tam and I shower and prepare for the evening. Rather than have a drink first we decide to go straight to Blu to eat. I start with the Lump Crab Martini and Tam has the Beef Carpaccio. Our mains are Rigotini Pasta (Kev) and Lamb Cutlet Salad (Tam). Mine is pleasant enough, but nothing special. Rather than have dessert in the restaurant, we go to Café Al Bacio, where we both have Pecan Pie and Tam has a liqueur coffee with Tia Maria. Over to the World Class Bar for a whisky based cocktail for me. Tam wants a Raspberry Lemon Drop, but they dont have any raspberry vodka, so they make her something very similar, which she says is very nice. Tam wants to go to the theatre to see a tribute to Whitney Houston. We get drinks to take with us  an Old Fashioned and a Tan Russian. Now, Whiney Houston has never been my cup of tea and so a tribute artist was always going to struggle to impress me. The woman makes it clear from the start that she is not a Whiney Houston impersonator, which is so much better than the guy taking the mickey out of Freddie Mercury last night. She has a really good voice, which would be even more enjoyable if I didnt have Tam screeching along like a ruptured alley cat down my left ear. At the end of the show the musical director does his usual spiel and tells us about the silent disco in Quasar, which is just about to start. He says it will be so much fun as 200 people will be attending. 200 people my arse! The maximum we see is 12. There are 3 channels, one of which doesnt work. None of the music is to my taste, but then again I dont suppose it was ever going to be given that Ive never been a fan of dance music. Tam finds something she likes though as they play some old disco. I have no idea why they dont pitch the style of music to match the age demographic. Still, Tam is having a good time and we grab a couple of beers as she dances nearly on her own. It is at this point that it becomes apparent that the alcohol is taking effect on Tam. Her speech becomes even less coherent than usual. Admittedly it would be difficult for the layman to tell the difference in Tams normal wittering to her drunken wittering, but an expert Tamologist such as myself can make the distinction. The fact that shes not walking quite straight is also a clue. We leave the empty disco and make our way to the Sky Lounge, where a band is playing to 20 or so people. We lie on a chaise lounge looking out the front of the ship, but its obvious fairly soon that Tam might be ready for her bed. Again, an expert in her behaviour, such as myself, can spot the telltale signs. Shes gently snoring. We walk back to our stateroom with Tam singing Chic songs. I try to tell her she should be a bit quieter, only to be met with an inane grin. Back in our room I write up my trip report as Tam attempts to read the daily newsletter for tomorrow. This lasts less than 30 seconds before shes asleep and I have to manoeuvre her under the covers and turn off her light. Ah well, she enjoyed herself.